European football's governing body Uefa will elect its new president on Wednesday, with two candidates standing to succeed the banned Michel Platini. 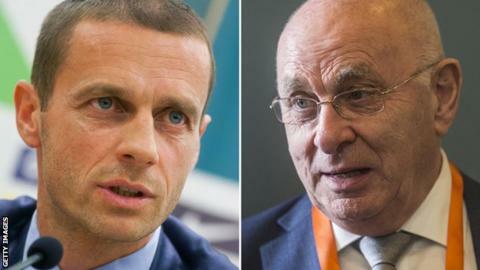 Platini resigned in May and will be replaced by either Slovenian FA president Aleksander Ceferin or Dutch FA boss Michael van Praag. The 55 national association members of Uefa are meeting in Athens to vote. The pair will address the Extraordinary Uefa Congress, laying out their vision of the future of European football. BBC Sport looks ahead to the election and the issues facing the winner. The president is in charge of the body that implements reforms and rules in football in Europe. Ceferin or Van Praag will likely begin the job by making clear a stance on the potential breakaway of the continent's top teams. In March it was reported that an elite invitation-only club competition breakaway - that would see the biggest English clubs partner with their continental counterparts - could be formed in a move that would mean huge change in the structure of European football. Ceferin last month warned it might lead to "war" between Uefa and clubs. Among other responsibilities, the Uefa president is also accountable for relations with world governing body Fifa and its president Gianni Infantino. Van Praag, 68, has headed the Dutch FA since 2008, and is also a Uefa vice-president. Ceferin, 48, has a background in law and has been in charge of the Slovenian FA since 2011. Sources close to him have told the BBC he has nearly 40 pledges of support from the 55 Uefa member nations. A simple majority of 28 votes is required to win the election. Spain's Angel Maria Villar, who has been Uefa's acting president since Platini's resignation, withdrew his candidacy last week. In his manifesto, Van Praag says he wants to "unify" football and make the sport "better, more simple and attractive" by reviewing rules and working closely with what he calls "innovative, independent thinkers" and fans. The Dutchman is also pledging to make the game safer and more secure for fans, offer more support to the women's game and to make the organisation more "efficient and mean and lean". Slovenia's Ceferin, who operates his own law firm, wants to introduce term limits for presidents and lobby for greater transparency in the game at all levels. Ceferin told ESPN he wants to battle match-fixing and is also keen to change the bidding process for the Champions League, European Championship and other major events. Like Van Praag, he is keen to support the growth of the women's game. Van Praag says that if elected, he will "reopen the negotiations" on the Champions League after complaints that England, Germany, Italy and Spain have been guaranteed four group-stage places from the 2018-19 season. Ceferin's stance is much the same, with the Slovenian wanting to consider the interests of the whole continent, rather than just the most powerful and wealthy nations. The next European Championship in 2020 will not be hosted in one country, nor co-hosted by neighbouring nations. Instead, matches will be spread between 13 cities across the continent. The new president will face re-election before the next Euros; but the selection of a host for 2024 is anticipated in 2018 and so a decision on whether to continue with the format implemented by Platini will likely need to be made by the new president and his committee. Who are the home nations backing? The Football Association (FA) declared its support for Van Praag last week. "Mr Van Praag would provide the strong leadership European football requires," FA vice-chairman David Gill said. "In all, he has a proven track record across domestic and international matters that can only help Uefa go forward." The Scottish FA will vote for Ceferin, while the Welsh FA and Irish FA have not disclosed their preferred candidate.